The tidal wave is over and the ancillary affects are particularly acute here in Massachusetts, where Governor Deval Patrick’s career prospects are suddenly more grandiose, as is the case with the handily re-elected Senator John Kerry, whose name is increasingly bandied about as the next Secretary of State or ambassador to the United Nations. Every MacBook-carrying member of the blogosphere has already anointed Kerry as a new cabinet member and they can’t all be wrong. So brace yourselves for a big political domino affect in Massachusetts starting now. For Kerry, Secretary of State is the granddaddy of consolation prizes and may assuage the soul of a complicated man who never quite recovered from the painful rejection that was the 2004 presidential race. But it’s the least President-Elect Obama can do. The Illinois senator’s keynote address at the Democratic Convention in Boston in July, 2004 was his inauguration as a figure of stature on the national stage. He’s president elect today, in part, because Kerry tapped him for that coveted and pivotal moment in time. Smart insurance policy by John Forbes that will now pay its dividends. Look for Kerry’s resignation shortly and his departure creates a remarkable special election contest to fill his coveted six-year term. Bet money on Congressman Steve Lynch being the first to jump in the waters (he voted no on the bailout bill with this event in mind); and put nothing beyond the ’most eccentric one’, a.k.a. Bill Weld, former Republican governor of the Bay State now slumming at the Trump Tower in New York, to plunge in just like he dived into the Charles River when once promoting his environmental agenda (that jump caused him a serious ear infection). Weld seems to be hopelessly and eternally bored, perpetually seeking some political mountain to climb no matter how high or intimidating. First there was the ill-fated task to become ambassador to Mexico, then his almost comedic bid for governor in New York; and I guess it’s our turn, again, to give Bill Weld a shot at yet another campaign. Think about it this way. Some Brahmins play polo; Weld plays politics. In fact, the former governor and U.S. attorney is actually more bi-political than bipolar, despite what his critics often contend. Though Weld is the only politician in the country to endorse Mitt Romney one month and then Barack Obama a few months later, there’s nothing necessarily crazy about that. It’s just typical Bill Weld showcasing his unique philosophical pendulum. But jocular comments aside, given recent scandals on Beacon Hill involving Democrats, voters may be quite receptive to a Weldian resurgence. If the former Cantabridgian is smart, he’ll run as an independent. I’d give him at least a one in five of taking it. Really. Back on the Democratic side, Steve Lynch will not die of loneliness in the primary. Martha Coakley retains the loyalty of Middlesex County voters, a key building block for any statewide campaign. Coakley was a highly popular district attorney before taking the A.G. slot in 2006 and is an articulate communicator. Her viability is obvious. As former congressman and assistant D.A. Marty Meehan once told me, "voters love to vote for the guys [gals] who send the bad guys to jail." Add to the probable special election contenders other hungry aspirants such as Congressman John Tierney, who would be the instant darling of the progressives. I can imagine Tierney wrangling for that key progressive block with Worcester Congressman Jim McGovern, who I think would be well advised to jump in the race. But the guy who’d take it in a walk, Congressman Barney Frank, is an unlikely participant from my view. The Newton Democrat was gearing up for a special senate election in 2004 in the event John Kerry won the presidency. But since then Frank has assumed the coveted chairman’s post at the House Financial Services Committee. He’s credited with shepherding the recent bailout bill through congress using a combination of whit and natural abilities to make the argument, and he’s got to be doing something right when Saturday Night Light decides he’s a big enough player to parody. I don’t see Frank giving up his national profile for a freshman’s seat in the upper chamber. Our own Congressman Capuano, you inquire? I doubt it. Michael Capuano has colder feet than an Eskimo as he proved when he was mentioned as a gubernatorial candidate before the advent of Deval Patrick. Some members of congress want to climb the ladder away from the tawdry task of being in perpetual campaign mode; the life of anyone holding an office affording a mere two year term. Others are perfectly content to sit there quietly without causing too much damage - and that would be our very own Congressman Capuano. And then there’s this. 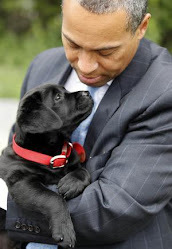 Governor Patrick has gone from being a close confidant of a very charismatic U.S. senator to being a close confidant of the next leader of the free world. I think presidents tend to surround themselves with smart people that they can trust. That tells me Patrick will be jumping on the Acela to Washington. Say hello to Acting Governor Tim Murray and yet another brewing contest: the governor’s race in 2010. The Thursday night Fox News poll shows Sen. McCain down by a mere three percentage points, and for my money McCain's campaign has internal data showing hope in Pennsylvania, where recent comments by Congressman Murtha (i.e. Western Pennsylvania is "racist" and comprised of "red necks") have hurt Obama, or atleast the congressman himself who suddenly has an opponent gaining ground on him. I'm convinced that everybody will watch Virginia on election night because the polls there close early, seven PM, and obviously it's an EST state, making an early call by the networks very plausible. If the major outlets quickly declare for Obama, I say McCain's toast. But if they still cant call it by nine PM, then that bodes well for McCain. Overall, as of election eve I see McCain with about a five percent chance of pulling off an upset. It's clearly Obama's to lose......maybe it always has been. McCain's had too many bridges to cross - out spent, an anti-Republican sentiment not seen since the post Watergate 1974 midterm election, economic dynamics clearly favoring the Democratic Standard Bearer, and a huge volume of unabashedly pro Obama media coverage which has skewed perceptions in the race against the G.O.P. nominee. It's rather amazing that McCain has been able to hold out as well as he has, given this political environment.